You have searched the store shelves high and low in the hopes of discovering a fruit jam worthy of the Paleo name, only to come home empty handed, confused as to why something as sweet as a strawberry has so much sugar added to it. We know, we have been there before, till we realized just how effortless it actually is to make jam at home. 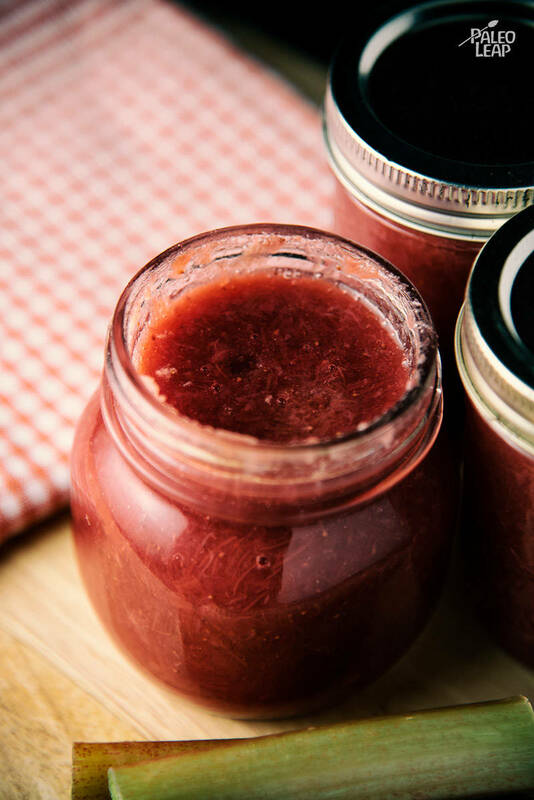 With just a few fresh ingredients, some clever chopping skills and heat under the pot, your homemade Paleo jam will be ready in less than an hour. And if you make enough at once, then you can save the leftovers in the refrigerator for a week. Rhubarb is for more than just pie and Paleo crumbles, and anytime you can sink your teeth into it, take it. Its use as a medicinal plant dates all the way back to 2700 BC, but eating the stalk didn’t become popular until the 17th century after sugar became an affordable commodity, and the rest is history, as they say. Red rhubarb is more commonly found in stores and at markets as the color is truly appealing, however rhubarb with green stalks is perfectly suitable for making jam with as well, and if you don’t expect the bright red color, there will be no disappointment as you focus on the intense flavor instead. You can lick this strawberry jam straight off the spoon, but a cinnamon waffle topped with this delicious compote, adding a rasher or two, will provide all the energy you need for the day – be it for work, or a weekend excursion to the beach. Add all the ingredients to a saucepan, and sprinkle with a pinch of salt. Place over medium heat, and bring to a light boil. Simmer 25 to 35 minutes, or until you reach your desired thickness. Mash everything and stir until smooth. Place the sauce in clean jar, and refrigerate until ready to serve.